I had never read The Swiss Family Robinson. The best-known English versions of this story are translated by William H. G. Kingston. First published in 1879, this version is not based on Wyss’ original story. It is instead based on Isabelle de Montolieu’s 1813 French adaptation and 1824 continuation in which she added/altered subplots and even characters. I’ll admit I was pretty indignant. It’s one thing to write alternate versions of your favorite stories. I don’t begrudge Montolieu that. But it’s another thing entirely for publishers to present her fanfiction as the original work. Note: I learned later that Johann David Wyss’ son, Johann Rudolf Wyss, is the one who completed and published his father’s manuscript and he asked Montolieu to write the second part of the story. So it’s not quite as bad as I first thought, but the textual history is still extremely complicated. Here’s a 100+ page paper on the subject if you’re really interested. At this point, Penguin Publishing House became my new best friend. If you want to read Wyss’ original story in English this is the only edition currently available. It reprints Mary Godwin’s 1816 translation, which is the most faithful to the original German and does not alter the plot or characters. No matter which version of The Swiss Family Robinson I’m reading, I always picture the characters the way they appeared in the 1960 film. We watched a lot of older movies and TV shows growing up, which led to James MacArthur being one of my first celebrity crushes. He was 52 years older than me, but since I was watching movies made 29 years before I was born it didn’t really matter. I don’t mind the fact that they based the film on the Montolieu translation/retelling. Films are never quite like the books anyway. In most cases I’ll be the first to cry, “The book was better!” but I’ll admit I’d have been tempted to add a love interest and pirates if I’d been in charge of adapting this book for the silver screen. It makes for a much better movie than the pedantic moralizing and scientific exploration that’s so much a part of the original novel. Speaking of pedantic moralizing, one of the first things you’ll notice in reading The Swiss Family Robinson is that there are times it reads more like a stuffy old sermon than an adventure story. Wyss the elder never originally planned to publish this story. He wrote it as an alternate-world fiction about his own family. It was meant to entertain his four sons while also exaggerating their character traits to help them see their own faults and strengths more clearly. He did, however, consent to it’s publication and one of his sons saw to it that that happened. The educational nature of the text is not limited to the moral education of children. 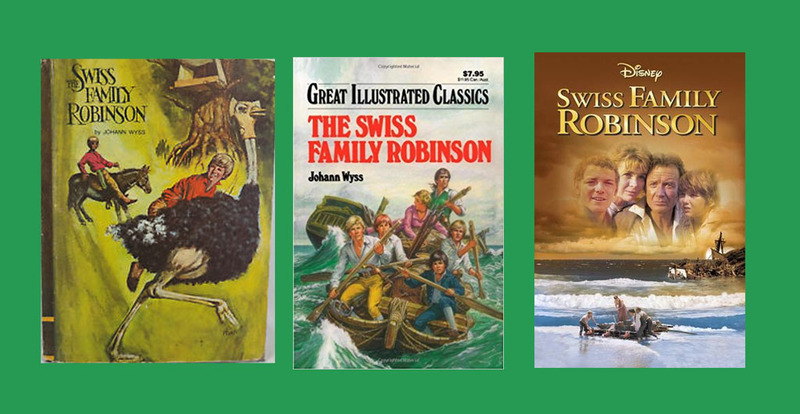 There’s also plenty of natural history, mathematics, and other subjects crammed into The Swiss Family Robinson. The facts about individual animal and plant species are, from what I’ve read, very well researched and are up-to-date for when the text was written. The species, however, are thrown together on this island haphazardly with no respect for geography. Animals and plants from different continents and habitats all share an island ecosystem fantastic enough that this book might very well qualify as speculative fiction. I enjoyed revisiting this book for my Classics Club book list. Once again, I read the Penguin edition. I’m planing to get a copy of the Montolieu version as well so I can compare the two for research purposes, as one does. I guess once an English major, always an English major. One of the things likely to jump out at a modern reader is just how much death happens in the pages of this book. The narrator/father raised his boys to be “sportsmen,” and they shoot at just about anything that moves. It’s a wonder the island has any animals left by the time he’s taught them to think before they shoot and refrain from killing things that aren’t dangerous and/or can’t be eaten. Still, this original version is less violent than the more widely known one, where the donkey is graphically strangled by a python and the family slaughters a large group of monkeys for revenge. Another change that surprised me is the role of women. Though the original Wyss version seems patronizing at times, the mother’s role is central to the story. According to the paper I read on this book’s textual history, though, she’s almost completely phased out in later translations and other female characters are brought in only near the end. Weird.